Note: The post below makes much the same point as this post on ‘As Easy as Riding a Bike’, and he mentions some stuff that I haven’t, so both posts are worth reading. I suspect we were typing simultaneously! I thought we were making some progress. I was feeling pleased with the good-natured discussions with Roger Geffen, the Campaigns & Policy Director of the CTC. I was really happy to see the CTC officially announce that they would be supporting good quality Dutch-style infrastructure. Well, today they had a chance to offer their support to a campaign which is demanding good quality cycle infrastructure, and they fluffed it. When I read CTC’s response to TfL’s dreadful proposals for the roundabout on the Westminster end of Lambeth Bridge, my heart sank. I didn’t want to have to write another piece criticising the CTC (well, not yet, anyway) but I have to call them out on this one. Our preferred option in this situation would be to redesign the layout of the roundabout along ‘continental’ lines – that is, with a single lane roundabout and small curve radii single exits and entry lanes. Such a design is recommended in the London Cycle Design Standards. So the CTC – who, let’s remember, recently declared support for quality segregation – are telling TfL that their design choice would be simply to reduce the roundabout approaches and exits to one lane each way, to be shared by cyclists and motor vehicles. To my mind, that is not “support for quality segregation” but more of the same “marginal improvements for existing cyclists” ethos. What they’re suggesting here is a solution which is fine for vehicular cyclists who can hold the lane and ride in a primary position (i.e. those who have the balls to get in right in front of the buses and taxis) but it will do absolutely nothing to attract people who don’t currently cycle. When my partner read the CTC’s solution, her first words were “I still wouldn’t ride there,” and I can’t argue with that. Most people don’t want to ride amongst motor vehicles. That’s an entirely reasonable and rational decision to make. So if we can’t even make it easy for bike riders to turn right at a fairly simple junction like this, then why would anybody who doesn’t already cycle on the road choose to use this route? Will the CTC’s design be attractive to those who don’t currently cycle? The Dutch solution is good for everyone – hardened VC commuters included – whereas CTC’s preferred solution merely improves conditions for those who are brave or stupid enough to cycle there anyway. Whilst we understand that the London Cycling Campaign have proposed fully segregated cycle tracks around the roundabout, we feel this is sensible only if priority over entering and exiting traffic can be provided to cyclists. 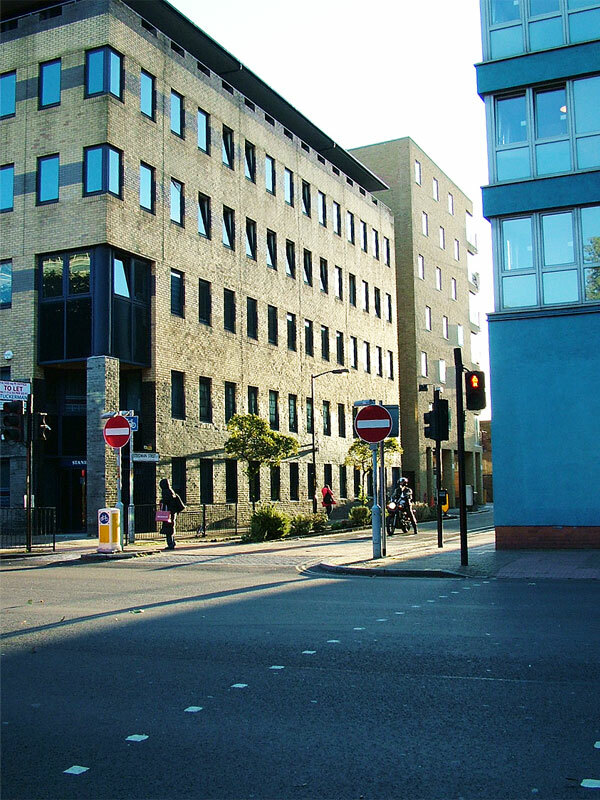 This could be achieved by extending the zebra raised table to the mouth of each exit and entry way, enabling priority cycle crossings to be provided in accordance with TfL and DfT guidance. Dutch guidance on the provision of cycle tracks at roundabouts is clear that cyclists must have right of way in these circumstances. Well yes, of course right-of-way is an important part of the Dutch-style roundabout! So you can now put this as your preferred solution, right? No need to suggest some sort of half-measure as your favourite. Oddly enough, the LCC said pretty much the same thing about a ‘continental-style’ roundabout. You can find it at the end of this article (although it was their second choice, not their preferred solution). Why on earth would they do that? Why give Boris the chance to say “what-ho chaps, we installed the roundabout that cyclists wanted, both the LCC and CTC asked for it!” You know he will. And when the first cyclist is killed at the new roundabout TfL will tell everyone that the design was recommended by the LCC and it was the CTC’s first choice. We campaigners need to stop asking for half-measures like this. Suggesting compromises is what TfL will do anyway, so let’s not offer them up on a plate. Would you go into a job interview and immediately say “I’d like £30,000 per year but if that’s too much then I’ll accept £15,000”? Because that’s what the LCC and CTC have done here. But the thing is, everyone else is asking for the good-quality Dutch-style roundabout. I’m pretty sure that readers of this blog (I love each and every one of you, by the way) have also read this and this and this and this and this and this and this and this and this and I’m sure there’s others. It seems to me that on this specific issue pretty much all cycling campaigners are united, while the CTC still say that they’d prefer cyclists to stay on the road, thanks very much for asking. 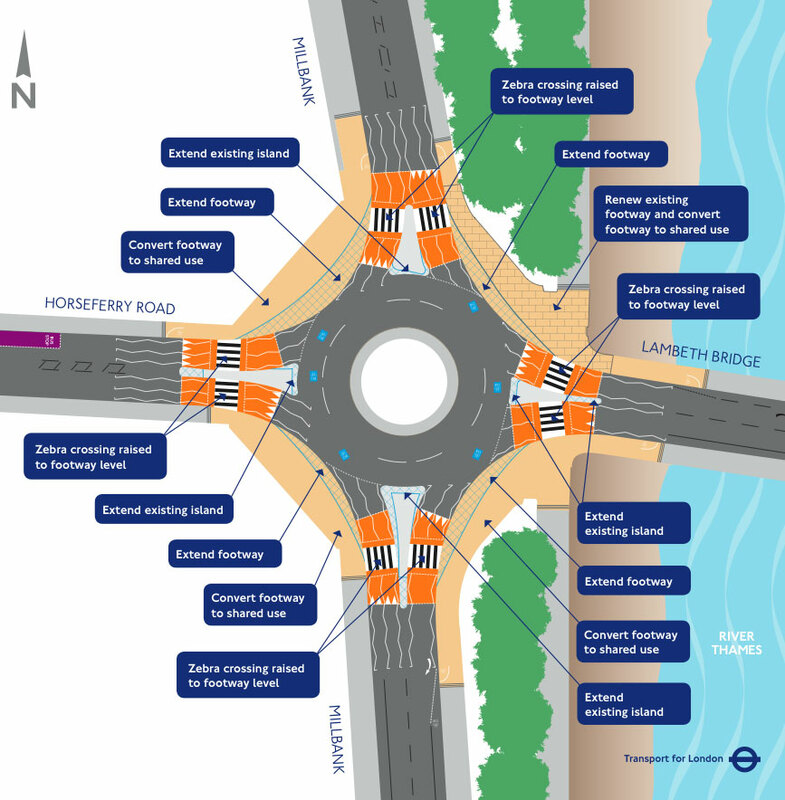 Based on their Lambeth Bridge roundabout statement it seems that the CTC are the ones who haven’t learned from history. Theirs is the voice which will cause the government to ignore real improvements for cycling. Currently, there is near-unanimous agreement about which is the best option for the Lambeth Bridge roundabout, and the CTC is the odd one out asking for more of the same old vehicular crap. Why are we campaigning? Who are we campaigning for? Do we only want marginal improvements for current cyclists, or do we want cycling to become a simple and safe transport option for the whole population? Asking for better vehicular cycling conditions is not going to induce more people to ride a bike – those of us who already cycle do so despite the conditions. We need improvements to infrastructure so that many more people will take up cycling because of the conditions; because it will be an appealing transport option. Demand the best, and who knows, we may even get what we want one day. They’re right to point this out – to me, the “bikes on zebras” thing is a cynical ploy by TfL to get cycling campaigners to accept their design, as it looks like you can ride around the roundabout with priority, of sorts. But once the dust has settled and the Met stops a cyclist from riding over the zebras, TfL will say “sorry we didn’t realise, we’ll look into it” and we’ll be pushing our bikes over the zebra crossings for the next five years while we wait to hear back. I know that John Forester is older than Mr. Burns (if not quite as pleasant) but while he’s still as sane as he’s ever been then I don’t see any reason to rebut his nonsense any less robustly than I would if he was younger. He’s a man who, apparently, has never visited the Netherlands and yet feels able to make bold claims about what it’s like to cycle there (passing through on a train in the 1930s does not count, John!). I’ve never visited wherever the hell Forester lives either, but I can guarantee you that the trees are made of old gloves, and the roads are full of custard. Obviously, this is ridiculous, but I have as much authority there as Forester does on the Netherlands, i.e. none at all. Coincidentally, ‘none at all’ is the amount of sense which Forester frequently makes in his online ramblings. Someone sent him a link to my post which put two of his comments about the Netherlands in context and he responded by accusing me of having no evidence to back up my assertions. How much evidence do you want, John? How about an entire country? One which I have been to, and you, apparently, have not! Are you really going to die having never visited the one place on the planet which has achieved high levels of safe cycling across all sections of society? It’s like being a life-long Elvis fan — a self-proclaimed Elvis expert, no less — yet you’ve never even visited Graceland. How can anyone take this incoherent drivel seriously? “The posting critical of the views of John Forester and John Franklin … is just one more of the illogical and sophomoric position papers in the spiteful controversy concerning bicycle transportation in the USA. Those with a fervent anti-motoring faith that if the USA copied Dutch bikeway designs and traffic law practices the USA would have an enormous switch from motor to bicycle transport. This is a faith for which there is no evidence whatever. Furthermore, there is plenty of evidence that such an outcome would be most unlikely, evidence from sociology, urban design, traffic engineering, psychology, and similar fields, areas in which the anti-motorists do not show expertise. The sophomoric nature of the presentation comes across immediately. For example, the photograph of a cyclist in sporting clothing riding on a bike path between a rural highway and open fields does not disprove the argument that, in urban areas, side paths get involved with a nasty tangle of driveway and intersection traffic. No single example of an exception disproves a general statement; only a contrary description of all the instances could do so. However, a picture of a crowded bicycling area does demonstrate the argument that such places are not suitable for cycling at American bicycle transportation speeds. There is so much wrong with this that I hardly know where to start. But I’ll start here: “a picture of a crowded bicycling area does demonstrate the argument that such places are not suitable for cycling at American bicycle transportation speeds”. What is he talking about? Is he suggesting that all US citizens are fast cyclists? Because the last time I looked, the average US cycling speed was almost zero, considering that pretty much nobody rides a bike there. He seems to be arguing for elitism in cycling, showing his belief that riding a bike should be reserved for the fast and the fearless. Anybody not fit and in a rush need not apply. The photo in question shows commuter traffic heading into Utrecht central station at rush hour. Is he suggesting that everybody should be able to travel at racing speeds, even in crowded city centres? Cars aren’t allowed to do this, and I wouldn’t recommend going for a jog around Paddington station at 5.30pm unless you really enjoy bumping into commuters. The fact that busy areas in city centres become crowded is proof of the success of cycling infrastructure in the Netherlands. It’s proof that people are choosing to cycle because it’s the fastest, easiest option. 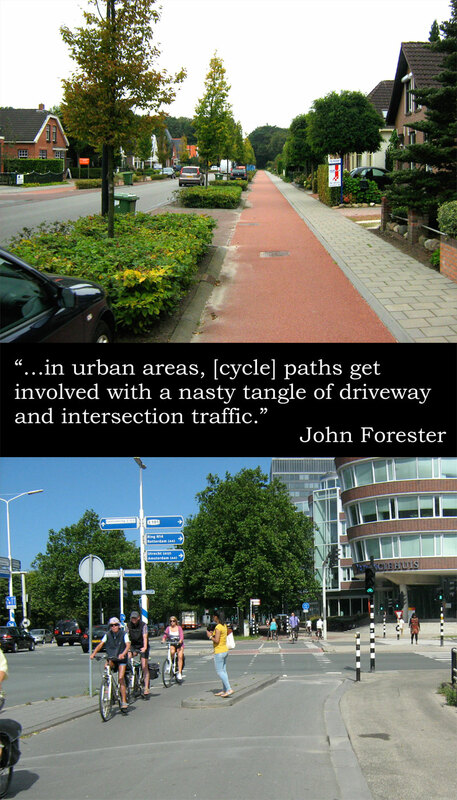 He also argues that “in urban areas, [bike] paths get involved with a nasty tangle of driveway and intersection traffic.” Well this just isn’t true, and I can say this because I have been to the Netherlands and studied their infrastructure, and John Forester hasn’t. He goes on to pre-empt this response by then saying: “No single example of an exception disproves a general statement; only a contrary description of all the instances could do so.” So what he’s saying here is that he won’t admit he’s wrong unless someone documents every inch of the Netherlands for him? Or maybe he’s saying that my photographs don’t mean his quotes aren’t true (although he’s happy to use just one photograph to back up his assertion about American speeds). How many photos do you want, John? I’ve got hundreds, and each one of them proves you wrong. Or maybe you want some statistics again? Well the Netherlands has a very high rate of cycling – far higher than the UK and the USA – and yet it has the world’s safest roads. That’s not “contra-factual argument” or “traffic-fearing cyclist faith” but cold hard statistics. 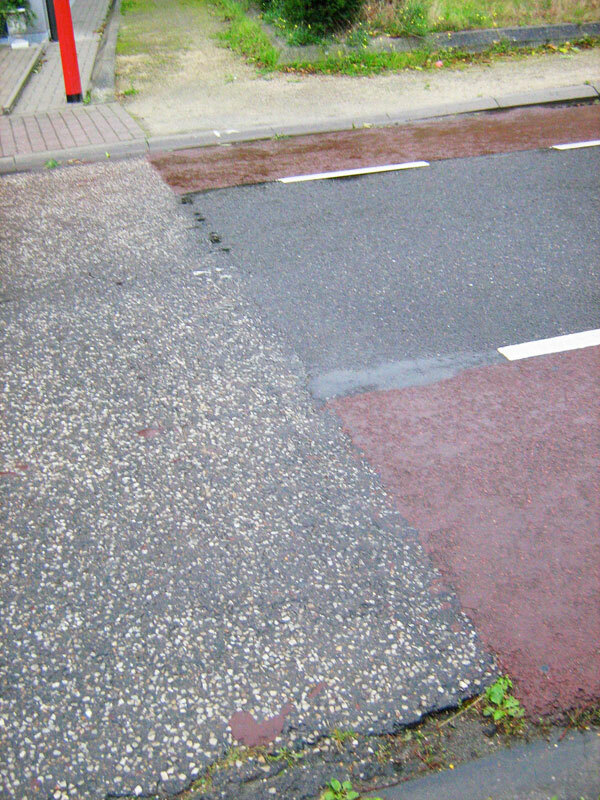 A nasty tangle of driveway and intersection traffic in the Netherlands, recently. Just because John Forester isn’t clever enough to envisage any practical solutions to make cycling attractive to everyone, it doesn’t mean that these solutions don’t exist. Do you get it yet, John? You don’t know what you’re talking about when it comes to cycle infrastructure, and the VC fundamentalism which you spread has failed to deliver anything but a risible amount of cycling – and a high accident rate – in the US. People in the Netherlands choose to use the bike for transport because the infrastructure makes it so quick and easy. Almost nobody in the US cycles, and it’s partially because John Forester backed the wrong horse in 1972 and spent the next 40 years shouting about it. 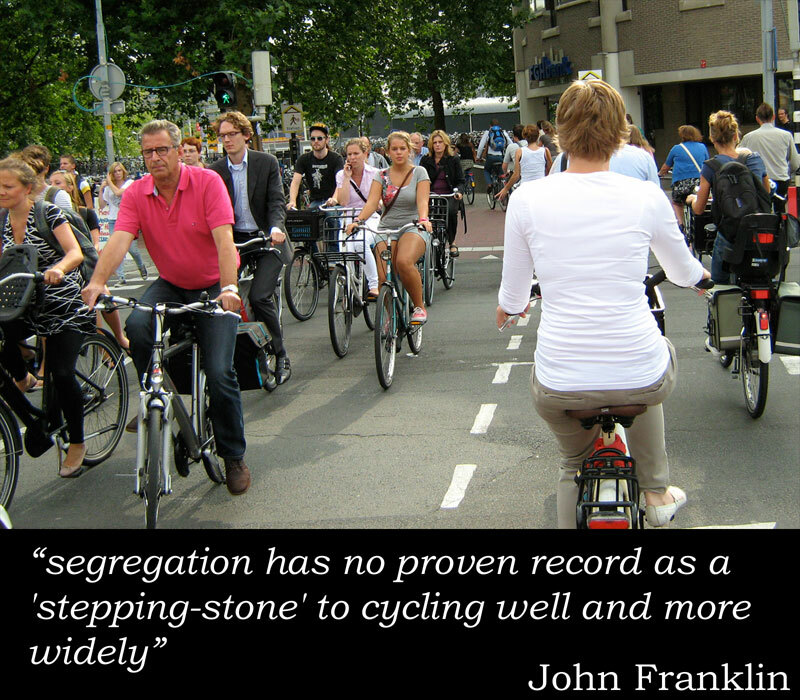 I welcome comments on this blog, but please understand what this post is about before typing: I’m criticising things that John Forester has said about cycling infrastructure in the Netherlands. This post has got nothing to do with the USA or any other country, so I can do without a load of comments about how it’s politically difficult for you, or how it’s economically impossible where you are, or how you ride on the roads and you’re 97 years old with one eye and you love it. All those things are fascinating but they have nothing to do with Forester being wrong about the Netherlands. The above message mainly goes out to Forester’s faithful army of “bicycle driving” zealots, especially “Erik”/”Clare Wolff” who posted the same message nine times on this page. Also, I know that Forester pushed against helmet compulsion and hates ASZs (“bike boxes” in the US) which shows that he’s not wrong all the time. But why can’t he see that people simply don’t want to ride a bike amongst motor traffic? Will Boris make TfL keep his promises? 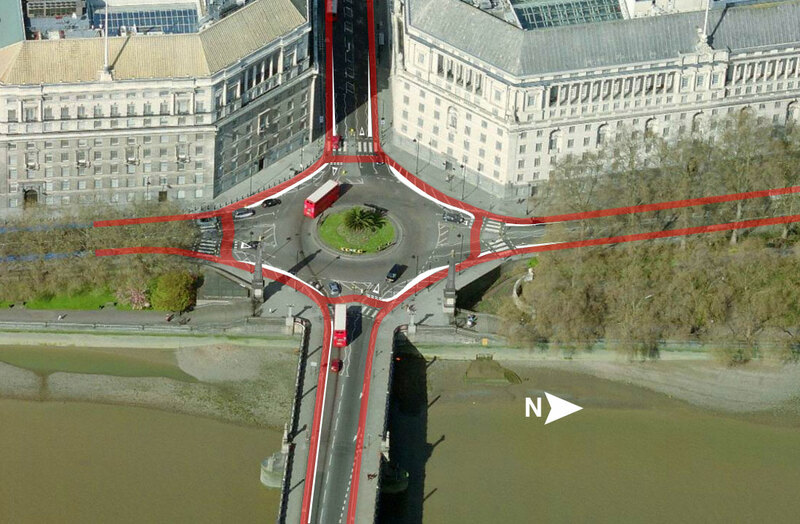 If this redesign of the western side of Lambeth Bridge is anything to go by, then either Boris’ adoption of LCC’s “Go Dutch” campaign was nothing but a last minute attempt to gain some votes from Ken Livingstone, or the Go Dutch message hasn’t filtered down the hierarchy to TfL’s design department. Where’s the Dutch? SHOW ME THE DUTCH! 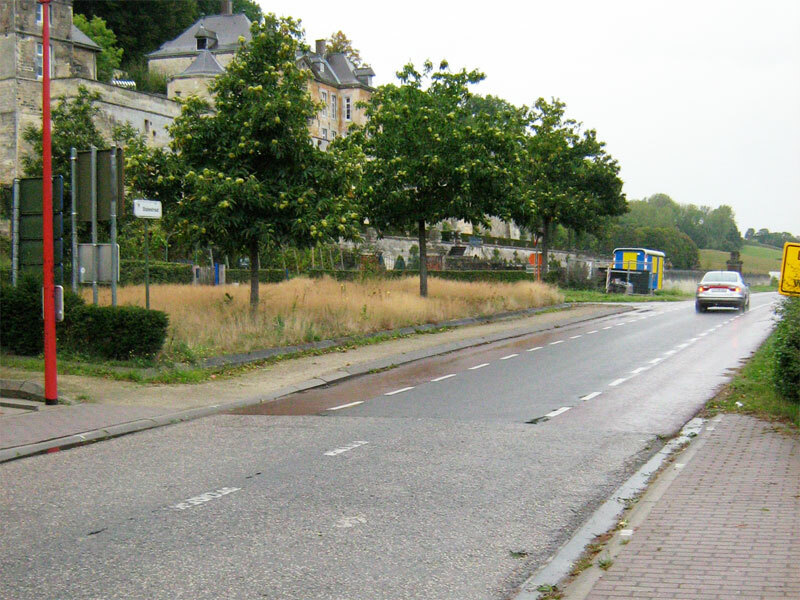 Shared use pavements do not make a Dutch-quality cycling environment. It seems that TfL’s main goal here is to not remove even one inch of space from motor vehicle users. The new widened footways are currently tarmac with white paint on them – a bodge from when this junction gave even more space to motor vehicles than it currently does. There’s tons of space here for a proper design. Why are TfL obsessed with keeping two lanes for each arm of the roundabout? All four roads are single-lane anyway so there’s no need to have two lanes for each road on the roundabout. As a driver I find this annoying and stressful – as soon as you have left the roundabout you have to merge with the other lane. This whole design stinks of business-as-usual and if it gets installed as currently designed then it will be a massive missed opportunity. So I implore you to tell TfL what you think about their poor design! The red paths are the cycle paths, and the white bits are physical barriers – raised kerbs, I expect. It’s not perfect – and I expect it violates a few DfT rules – but it’s much better for cycling than TfL’s original design. I haven’t tackled what happens further along the roads, but Millbank (to the south) has Cycle Superhighway lanes on it which would link up nicely. Note how no space at all has been taken from pedestrians. (I suspect the odd nibble into the pavement wouldn’t harm, there are some very wide pavements here already.) And no space has been taken from the acres of tarmac available to motor vehicles on the roundabout, either. Little changes for pedestrians, but cyclists would have priority when going around the roundabout and only give way to pedestrians, once just before joining the roundabout and once just after leaving the roundabout, which seems fair enough to me. I’ve used roundabouts like this in the Netherlands – much bigger, more complex and busier ones, too – and they really do work, for everyone. Feel free to suggest improvements – maybe we can make a submission to TfL if a technical enough drawing can be made? 2) do Boris and TfL have the cojones to keep their promise and actually Go Dutch with junctions like this? Time for more holiday snaps now! For some reason, crossing a border seems like it should be and exciting event. Perhaps it’s because most of us live far from a border of any sort. Although I live close to the anti-cycling wastelands of Westminster, the actual border isn’t marked in any way – perhaps there should be a cycle-and-crossbones sign. The border itself is a bit of a let down – the Netherlands and Belgium removed their border controls in 1970 so there’s not much to see – but I did find something interesting on the ground. Can you see what it is? Can you tell where the border is? (And yes, those are hills in the background.) A sunnier view can be found here. How about a close-up – which side has better cycle facilities? Belgium vs Netherlands, see it for yourself here (Google Streetview) and here (Bing aerial photos). The two photos above are taken from the same location, but pointing in different directions, and the difference couldn’t be more stark. I think this road is so wide because it was once a border crossing point, but while the Netherlands has made it a pleasant and safe environment, Belgium has instead decided to utilise the space to use up their surplus road paint supply. 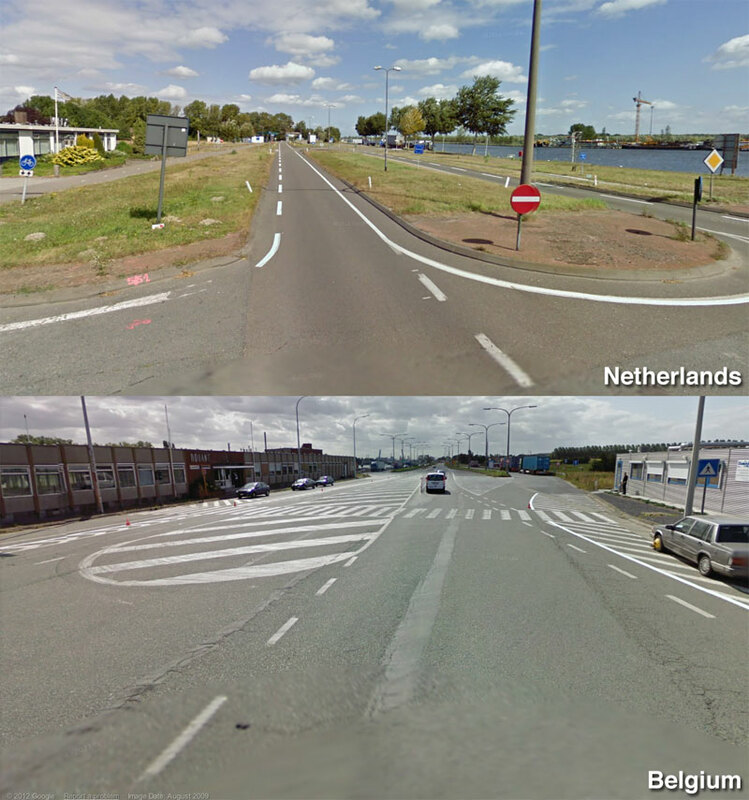 Note how the generous two-way separate cycle path in the Netherlands (which you can see on the left of the top photo) becomes a narrow painted lane at the edge of the road in Belgium. Follow the road further south and you’ll see that the narrow painted lane is all you’ll get. There’s also another one-way cycle path in the top photo, on the other side of the road, to allow northbound cyclists safe access to the two-way cycle path, and to provide access to the waterside. Which side looks more attractive to cycling to you? See it for yourself here (Google StreetView) or here (Bing aerial photos). 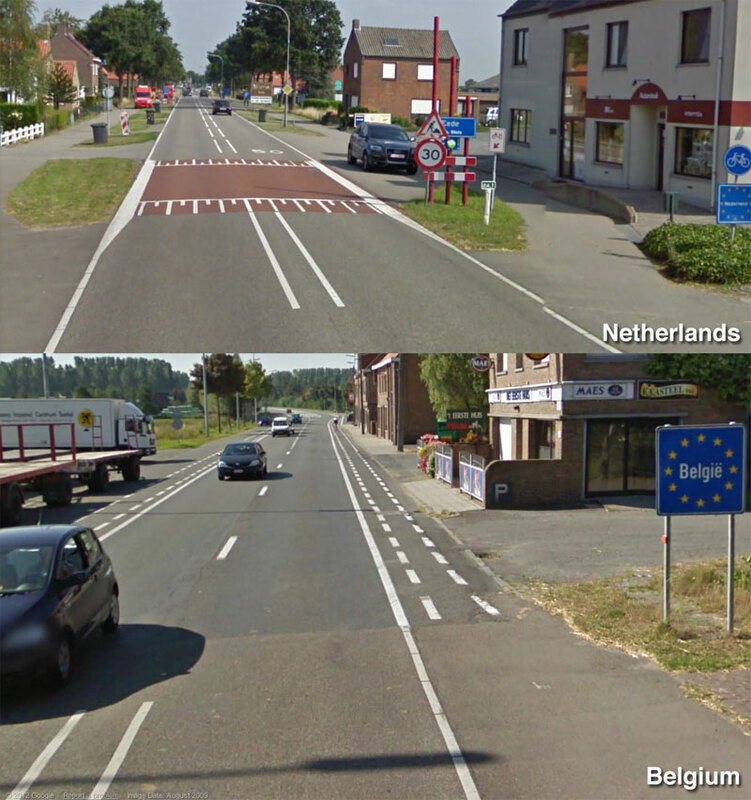 Again, good quality separated cycle paths turn into narrow painted lanes at the border. See update at the bottom of this post! The irony is that the cycle exemption signs here are completely unnecessary anyway – cyclists don’t go between the two no entry signs, but down the cycle bypass to the left of the illuminated bollard. So these signs add nothing of value for cyclists whatsoever, but I’m sure it will look good in their end of year report when the council claims to have installed new cycle contraflows. Still, it makes a change from authorities actively harming cycling. I’m sure that the cyclists of Waltham Forest would be happier if their council stuck to this sort of zero effect meddling. So congratulations to Southwark Council for installing the most pointless but harmless cycle infrastructure of the month! Update: I’ve been told that these signs have in fact been in place since 2003, which means that they were illegal for eight years! I’d assumed they’d been added with the changes to the regulations in 2011. Either way, they’ve never been necessary as cyclist heading in that direction never passed between the signs, but down the cycle path to the left. 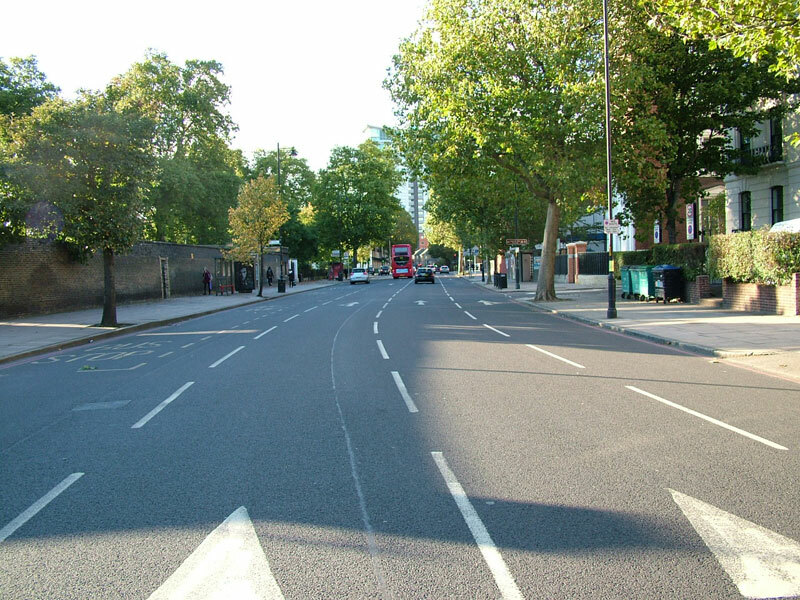 I was preparing a piece on the recent death of Hichame Bouadimi on St. George’s Road in London, and although Charlie Holland and Freewheeler have already written fine articles about it (and Charlie wrote about the road back in January), I’d like to add my thoughts. The death took place on a road that I walk or cycle along pretty often. I’d been planning to write about it for some time, in fact, as the whole road is unnecessarily wide with few crossings, no facilities for bikes, and it runs beside three schools and a park. It’s essentially a motorway which has been driven through the heart of a community, and a perfect example of over-provision for motor vehicles. Unless this road is changed there will be more deaths like this. Where it happened. How have we as a nation become so used to seeing flowers by the road, without demanding change from our government? The craziest thing about this road is that the traffic levels aren’t that high – there is no reason for it to be this wide. I was there on Friday at rush hour (from about 4.30pm – 6.30pm) and the queues of cars were so short that every green phase cleared the whole junction of vehicles. This leads me to see a problem endemic in UK street and road design: the default is to make a road as wide and as fast as possible, and any restrictions on driving must be justified, in triplicate, signed and counter-signed and finally buried in soft peat for three months before being reused as firelighters. (Or something like that.) As a result, St. George’s Road is one-way with four wide lanes and a 30mph speed limit which is almost constantly ignored. Does this look like a 30mph road running through a residential area full of schools? This isn’t right. 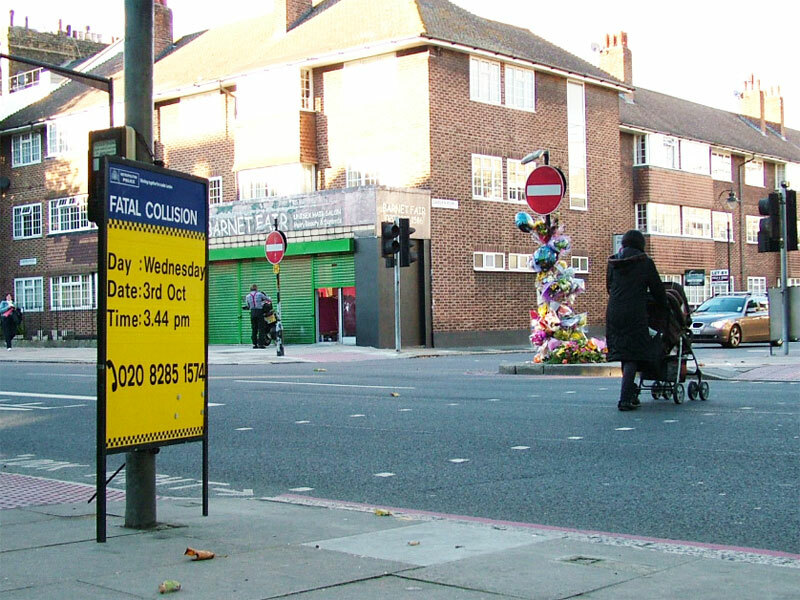 Hichame’s death was avoidable, yet Boris Johnson and TfL are still focussed on increasing the speed of motor vehicles in the city. But I don’t think those in charge give a toss about us normal people. My first post on this blog was about the death of Gary Mason in January 2011, which occurred because a driver took advantage of poor road design. 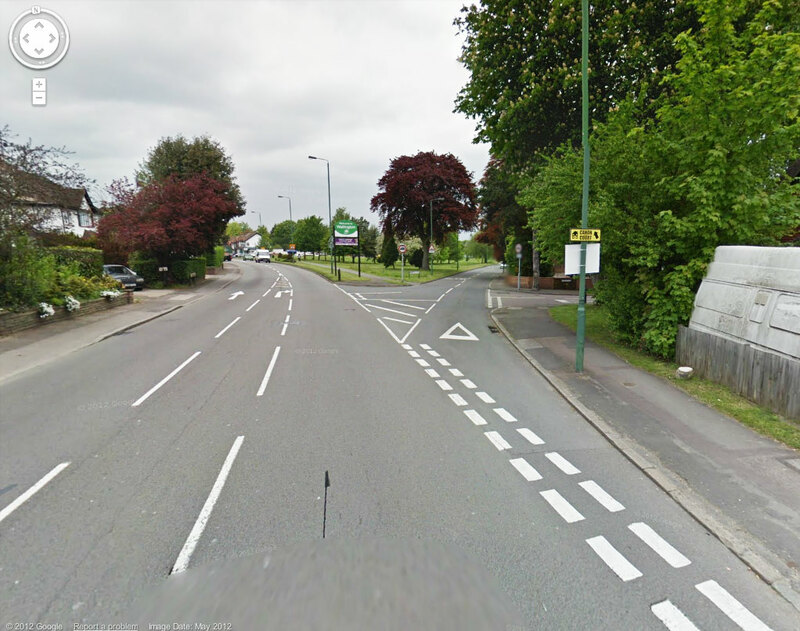 The image accompanying that piece were taken by Google Streetview in 2008, showing the road layout which contributed to the tragedy. Since then, Google has been back in town and updated its images in May 2012, one-and-a-half years since Gary’s death. Surely the council has made some changes to rectify this lethal junction? No change here. Sandy Lane South, more than a year after Gary Mason’s avoidable death. Nope, they’ve done nothing at all. This makes me sad and angry. Whoever is responsible for this road should hang their head in shame. It would be so cheap and easy to fix this junction, yet those responsible continue to do nothing. This is an insult to Gary Mason’s family. 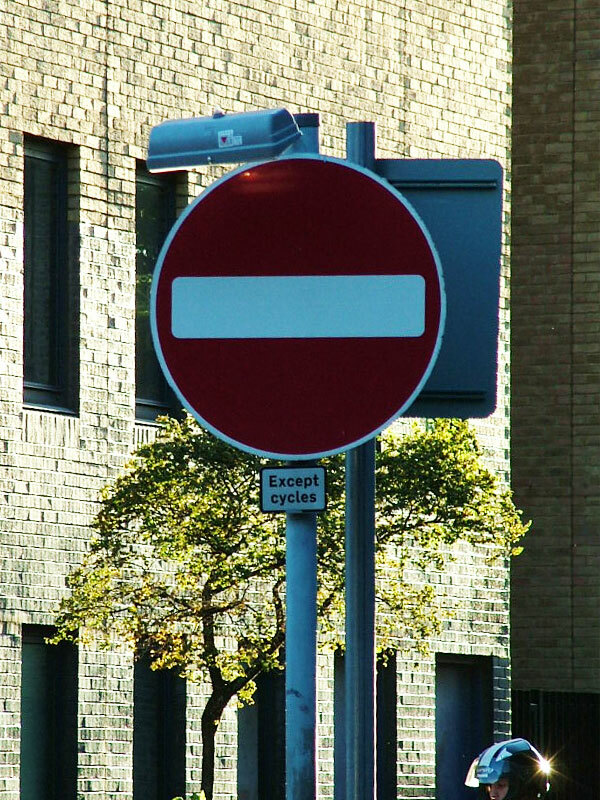 Will the same inaction occur on St. George’s Road? It doesn’t have to be this way. There will be more deaths if Boris sticks to his “smoothing traffic flow” (i.e. increasing vehicle speeds) mantra and if central government remains car-focussed. To all who are responsible for the roads and aren’t arguing against this type of mentality, let the next death and all those to follow be upon your conscience.